How to Make an Animal Topiary? Explore our guide on how to make Topiary frames, topiary horses and more! When creating animal topiaries, it is wise to choose vines and plants with dense foliage. These fill empty frame spaces and form solid mat shapes. Boxwood shrubs and Japanese holly work well. On a smaller scale, herbs create beautiful and functional animal topiaries. Using rosemary, thyme, and lavender brings a fragrant aroma to the air and dense foliage to the design. Besides being hardy outdoors, these herbs offer tiny flowers that enhance interior decor. Ivy vines make forming intricate topiaries very simple. Vines can be wound around the forms and attached. They are easy to trim as well. Animal topiaries bring interest and attention to any space. Uncovering the best topiary forms will result in beautiful accent pieces that can be displayed in gardens or another special places. Take a few moments to look at your animal. Then look for plants which best represent it. Fur, feathers, mane; smooth, fluffy, scaly. Picture your animal dressed in plants. Don’t forget detail: whiskers in kittens, stripes for bees, and eyes for personality! Plant color can create a pattern in your animal. Smaller leaf plants work best on smaller animals. The idea is to compliment, not overwhelm the form. Let the plant (box wood, euonymus, ivy) grow into the form. Trim the plant until it fills the form. Soak the moss filled form in water and let drain. If you have 'cell pack' sized plants (3/4”-1 ½” sq.) you can poke a hole into the damp moss from the outside of the form and insert the plant. Soak the moss filled form in water and let drain. Snip the plastic connecting ties and open the form into its parts. Pull out some of the moss. Remove a little of the soil from around the root ball and insert your plant into the form. Wiggle the leaves up through the wires. Repack the moss around the roots. When planted, reattach the form with the cable ties provided. If using A or B above, water with starter fertilizer 10-52-10 & keep in a shaded area, out of the wind for several days before moving to the selected area in your garden. Check for water daily, as you would a hanging basket. Fertilize every other week. Planting a topiary, taking care of it, determining its development and watching it grow-is a rewarding and fulfilling craft and art. 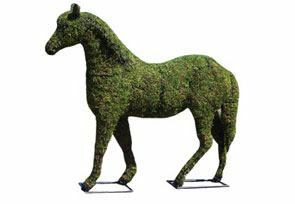 Below is our most popular topiary: "horse topiary frame mossed"!